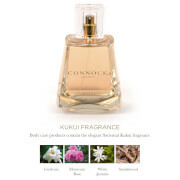 Reflect the soul and beauty of the Hawaiian Islands with Kukui Eau de Parfum from Connock London. The elegant fragrance is inspired by the Gardenia flower and is complemented by a bouquet of other fresh flowers. A combination of Italian Bergamot, White Jasmine and Calla Lily is enriched with richer notes of Sandalwood, Cashmere and bitter chocolate sweetness.